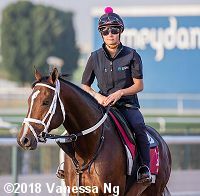 On Sunday morning in Dubai, entrants for the $10 million Dubai World Cup (G1) and its rich undercard were at Meydan Racecourse on the main track. Conditions were typical for late March in the Emirates, with clear skies and temperatures in the low 80's during training hours before climbing to the mid 90's during the day. The races will be run Saturday evening (Saturday morning in North America), with the World Cup going to post at 9:40pm local time (1:40pm ET). In North America the full card will be broadcast live on TVG in the U.S. and HPI-TV in Canada. In addition, NBC Sports Network will broadcast the four Group 1 races from 9:30am-12:30pm. 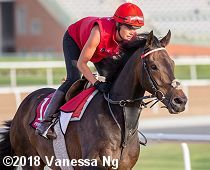 Here are photos and comments for 35 horses that were out Sunday morning. Please click the smaller photos to see a larger version. 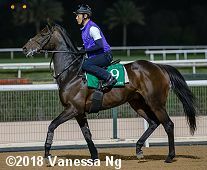 Awardee (Dubai World Cup) comes to Dubai off a 9th place finish in the February Stakes (G1) at Tokyo after finishing 3rd in the Kawasaki Kinen. 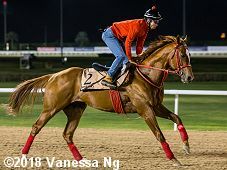 He is winless since the JBC Classic at Kawasaki in November 2016, and was 5th in the Dubai World Cup last year. Forever Unbridled (Dubai World Cup) comes here off her Breeders' Cup Distaff (G1) win. Before leaving Louisiana she worked 5f in 59.6 seconds at the Fair Grounds. Trainer Dallas Stewart said, "She went in 59 3/5 (seconds) and her last quarter in 23 seconds after getting her three furlongs in 37 3/5. She picked it up nicely the last quarter. She's dedicated to winning all the time: every race, every work, every gallop. We're very happy to be invited to Dubai and hopefully we can meet the challenge. After last year and her season, we're confident in her and excited for the Dubai World Cup. She's won eight races over eight different racetracks. She loves it wherever she goes and she gives it her all." 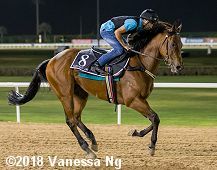 She is Stewart's first runner in Dubai. 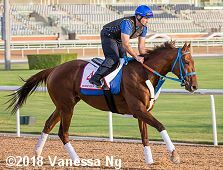 Gunnevera (Dubai World Cup) galloped 2 miles on the main track Sunday. Trainer Antonio Sano said, "I am so proud of my horse. He is very well right now and I am happy with him. He worked five furlongs in 58.3 seconds (at Gulfstream before flying here) and never in his life did he look so good. It is a good moment for my horse. 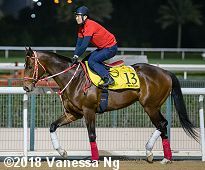 I know the others in the (Dubai World Cup) will be very tough and it is a strong race, (but) he is better (than ever). He is bigger and stronger; a different horse. He is very good, maybe best, at the distance. He relaxes and at the three-eighths-pole, he makes his run." 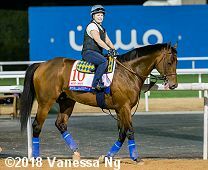 Mubtaahij (Dubai World Cup) is one of two runners trained by Bob Baffert. Winless since last year's Awesome Again (G1) he comes here off a 2nd place finish in the Santa Anita Handicap. Previously based in Dubai, he won the UAE Derby in 2015, was 2nd in the Dubai World Cup in 2016, and finished 4th last year. 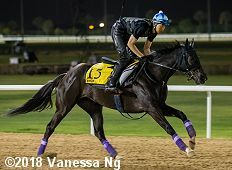 Pavel (Dubai World Cup) went out on the main track for a 2 mile gallop. Trainer Doug O'Neill said, He's in a consistent place right now and he's very fit and ready. In (the San Pasqual), it was very unfortunate with all the traffic trouble he had. I'm very, very happy with how he's doing right now. He's acting like he's going to run the best race of his life and he would need to in order to win the Dubai World Cup. He's a proven shipper who eats well and you need a horse who takes his track with him like he does," he continued. "He checks all the boxes and has the characteristics you look for when shipping to Dubai and could be very successful. Horses of that quality, sometimes it's just a matter of staying happy and healthy during the trip." 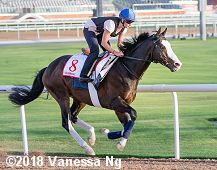 Talismanic (Dubai World Cup) galloped twice around the main track. 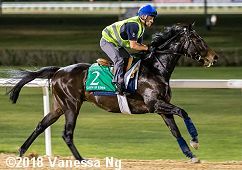 Lisa-Jane Graffard, manager for Godolphin in France said of the Breeders' Cup Turf (G1) winner, "How Talismanic handles the dirt on his first try in competitive conditions is the big unknown and the hurdle he has to overcome. I think it's worth repeating that he's the kind of horse that encourages you to try (because) he's talented, he's unflappable and he's adaptable. I would say hopeful rather than confident." 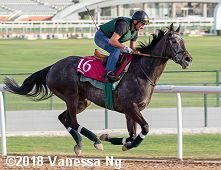 West Coast (Dubai World Cup) worked 6f in 1:11.8 at Santa Anita before flying to Dubai. Breaking off about five lengths behind stakes-winning stablemate Cat Burglar, he inhaled his workmate at the top of the stretch and easily cleared him in the lane to stride out impressively. 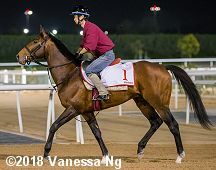 Sunday he has his first jog over the Meydan track. Cloth of Stars (Sheema Classic) is the highest rated (125) contender in the race. Lisa-Jane Graffard of Godolphin France said, "He broke two (2000m) track records last year in the (Group 3 Prix) Exbury and the (Group 2 Prix d') Harcourt and, as a 3-year-old, he won the (Group 2 Prix) Greffulhe in a very fast time. He won the Ganay and he then put in a top-class performance to finish second in the Arc to Enable. He deserves plenty of credit for what he has done so far � a G1 performer at 2, 3 and G1 winner at 4. He's only been in Dubai for a few days, but the trip went well and he is settling in well, so everyone is happy with his preparation so far." Rey de Oro (Sheema Classic) won the Japanese Derby in 2017 and was a close second in the Japan Cup (G1). He comes here off a third place finish n the Kyoto Kinen (G2). Satono Crown (Sheema Classic) came out at 5AM local time for a light gallop. Trainer Noriyuki Hori said, "Both Neorealism and Satono Crown have been back to my stable for a while and they are in good form. All has (gone) as planned so far. 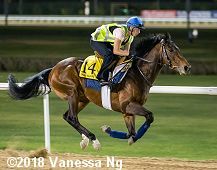 I have been to Dubai for the Dubai World Cup meeting many times and have learned a lot from those experiences, so that I am now working hard to make the most of what I have got. I knew the (invites) from the Dubai Racing Club were coming, so I had already made a travel plan and I discussed the trip with the owners. (Satono Crown and Neorealism) definitely have chances." Crocosmia (Dubai Turf) exits an eighth in the same 2200m Kyoto Kinen in which Rey de Oro was third and shortens back to her best trip. Deirdre (Dubai Turf) winner of the Shuko Sho (G1) galloped once around. Neorealism (Dubai Turf) galloped 2 miles over the turf course. Trainer Noriyuki Hori said, "Both Neorealism and Satono Crown have been back to my stable for a while and they are in good form. All has (gone) as planned so far. 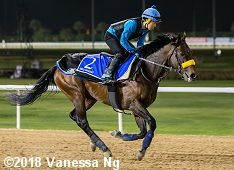 I have been to Dubai for the Dubai World Cup meeting many times and have learned a lot from those experiences, so that I am now working hard to make the most of what I have got. I knew the (invites) from the Dubai Racing Club were coming, so I had already made a travel plan and I discussed the trip with the owners. (Satono Crown and Neorealism) definitely have chances." 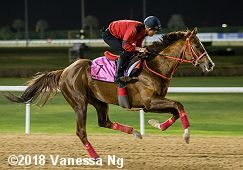 Real Steel (Dubai Turf), winner of this race in 2016, went out for a 2 mile gallop over the main track. Trais Fluors (Dubai Turf) returned from a seven months break to finish second in a conditions race over 1600m on Chantilly's all weather track on March 6th. The four year old son of Dansili had been off the track since finishing fourth in the Group 1 Prix Jacques Le Marois last August. Vivlos (Dubai Turf) is back to defend her title. 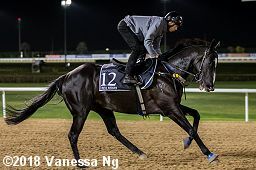 He galloped twice around the main track. Trainer Yasuo Tomomichi said, "She is in even better condition now than she was last year." Matera Sky (Golden Shaheen) is a a 4-year-old Kentucky-bred son of Speightstown who has shown promise this season with a pair of 6f dirt stakes wins, including the Kashihara Stakes at Kyoto on February 17th. 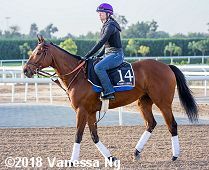 Mind Your Biscuits (Golden Shaheen) galloped once around the main track with owner-trainer Chad Summers watching from the rail. Before flying to Dubai he worked 5f in 59.45 seconds at Palm Meadows. Summers said, "The work was exactly what we were looking for," Summers said. 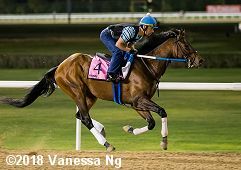 "He worked in company with a filly of (trainer) Eric Guillot's who ran in a Grade 1 last time out and the turn-of-foot he showed was tremendous. We won't do much with him now. We'll let him get settled in and blow him out down the lane early next week. Being prepared for all the minute details and crossing your T's (is important). Hydration is key (in Dubai) and keeping him happy. 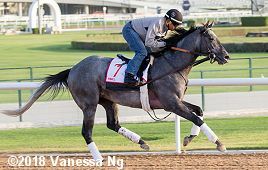 We do need to watch the track, as inside speed has continued to look strong at the current (Dubai World Cup) Carnival." 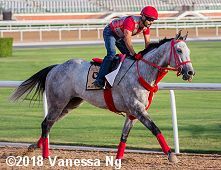 X Y Jet (Golden Shaheen) galloped over the Meydan track for the first time since arriving from Gulfstream Park. He finished second as the beaten favorite last year. 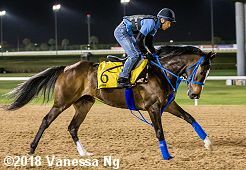 Trainer Jorge Navarro said, "He hasn't been an easy horse to train because you have to figure him out. He's an old warrior with battle wounds, so you just have to manage him and let him tell you when he's ready to do things. His attitude hasn't changed at all. He's still a mean horse who wants to tear you up sometimes and (when he runs) he loves the competition, but he also protects himself." 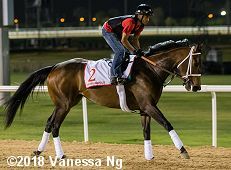 Reride (UAE Derby) is taking the unconventional route to the Kentucky Derby for trainer Steve Asmussen and owner Ron Winchell. 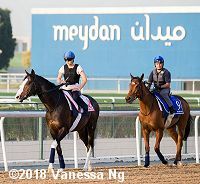 David Fiske, racing manager for Winchell said, "We just thought that there was an undiscovered road to the (Kentucky) Derby that runs Delta-Sunland-Meydan. Reride, to this point, has shown himself to be reliable, undeterred by distance and able to ship. 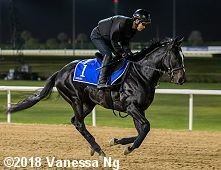 We thought his running style would suit the UAE Derby and the purse is very attractive. Mr. Asmussen has demonstrated he can successfully take a horse to Dubai." 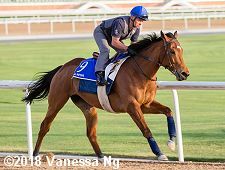 Ruggero (UAE Derby) galloped twice around on Sunday morning. A winner of the Cattleya Sho over 1600m on November 25th, he exits a good third in the Hyacinth Stakes over the same course and distance at Tokyo Racecourse. 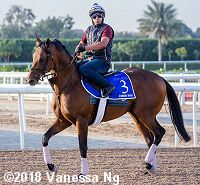 Taiki Ferveur (UAE Derby) went out for 1 1/2 mile gallop on Sunday. A progressive type, he began to wake up at the tail end of his juvenile season and was a fine second, one spot to the good of Ruggero, in the Hyacinth Stakes. Adirato (Godolphin Mile) comes back to Meydan after disappointing in 12th in last year's UAE Derby. His 3 career wins have all been at 7 furlongs. Akito Crescent (Godolphin Mile) one of the rare sons of American champion and breeding-ambivalent War Emblem, was a good third in the Tokyo Chunichi Sports Hai Musashino Stakes (G3) over this trip on left-handed Tokyo Racecourse in November. A dual stakes winner, he took the 1400m Galaxy Stakes on December 24th and returned to finish 12th in the Negishi Stakes (G3) over sloppy conditions. 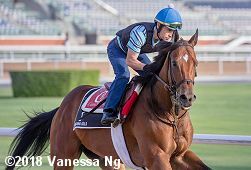 Economic Model (Godolphin Mile) comes to Dubai off a 2 race win streak for trainer Chad Brown, an allowance at Belmont in October and the Hal's Hope Stakes (G3) at Gulfstream in February. Rosa Imperial (Godolphin Mile) comes here off a close second in the Prix Anabaa at Chantilly over 6 1/2 furlongs on Polytrack. Lisa Gane Graffard of Godolphin France said, "We are delighted with Rosa Imperial's run. She showed a nice turn-of-foot. She'll appreciate a faster pace, as well. She is a talented filly with more to come. It's a very tough race this year � it just keeps getting better and better." 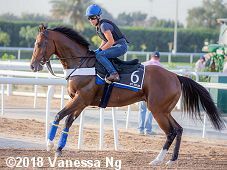 Special Fighter (Godolphin Mile) finished 5th in the Al Maktoum Challenge Round 3 (G1), the main local prep for the World Cup, after finishing 5th in the Dubai Millennium Stakes (G3), so is ducking the big race on Saturday. 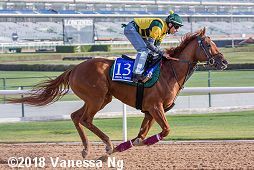 Prince of Arran (Dubai Gold Cup) won the Range Rover Sport Handicap on February 18 but was 8th in the Nad Al Sheba Trophy (G3), the main local prep for the Gold Cup. 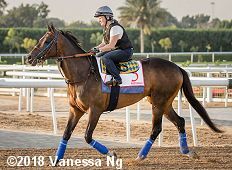 Run Time (Dubai Gold Cup) will be the first U.S.-trained runner in the 2 mile race. 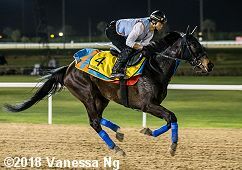 Trained by Mike Maker, the Bloom Racing Stable and Allen Racing-owned son of Gio Ponti looked well within himself going through a light gallop both Saturday and Sunday. Two races back, Run Time defeated Grade 1 winner Bullards Alley over this distance in the Allen Jerkens Stakes at Gulfstream Park. Owner Jeffrey Bloom said, "While it took us quite a while to break his maiden, we had always expected him to move forward. He acted like a good horse and finally the light switch went on. Also, it was apparent that the more distance of ground, the better and those types of races are hard to come by. He, of course, solidified our opinion in the Allen Jerkens, both with the distance and the quality of horses he beat. It seemed like an obvious time to take a shot in coming to Dubai with him." 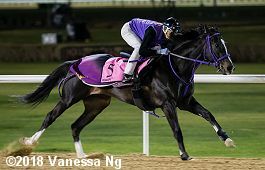 Vazirabad (Dubai Gold Cup), two-time defending champion in this race, is back for looking for the three-peat. 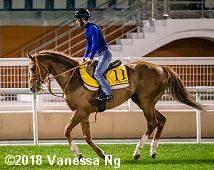 Hit The Bid (Al Quoz Sprint) won the Watch Time Handicap on Feb. 8 then followed that up with a 3rd place finish in the Meydan Sprint (G3), one of the main preps for the Al Quoz. Holding Gold (Al Quoz Sprint) went out on the main track. He is the first Dubai starter for trainer Mark Casse. Assistant trainer Randi Melton said, "He looks really good and he's settled in really great." Illustrious Lad (Al Quoz Sprint) arrived from Australia on Wednesday and was out for his daily gallop. Music Magnate (Al Quoz Sprint) represents Australia in this 6 furlong turf sprint. Stormy Liberal (Al Quoz Sprint), winner of the Breeders' Cup Turf Sprint (G1), comes here off a second place finish in the Daytona Stakes (G3) at Santa Anita. The grandstand at Meydan with Vazirabad (Dubai Gold Cup) on the track.